This bread recipe can made in one hour, but don’t let that fool you. It’s delicious, crusty on the outside and soft on the inside. It will become a family favourite! I am pleased as punch to welcome you to another edition of Burning Down The Kitchen. It’s a series near and dear to my heart. One where I get to know my blogging friends a little better, and have the pleasure of sharing that experience with my readers. Today I have the distinct honour of sharing an interview with a very special blogging friend, Donna of Cookistry. For those who already know Donna I hope this interview helps you get to know her a little better. For those who do not know Donna I know you are going to love her and become regular readers of her blog, Cookistry. I met Donna through our blogs, but our friendship extends beyond that. Donna is one of those friends you can be real with. When you have a crappy day she just gets it. She doesn’t try to sugar coat it for you, she’s just there for you. I dig that about her. You’re going to dig her too, and all her amazing recipes. 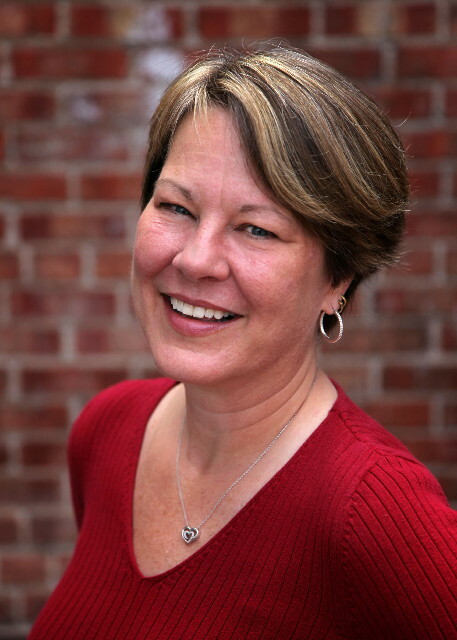 Meet Donna Currie of Cookistry. You’re going to love her as much as I do! 1. How did you get started blogging? I had been working as a freelance writer and an editor for many years, but thought that food writing might be more interesting than some of the other topics I was writing about at the time. And I loved to cook, but didn’t really write down recipes. 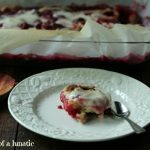 I figured that a food blog would be a great way to archive recipes, and that it could serve as a resume to get paid writing jobs. 2. What’s your favourite part of the job? I love cooking and baking. And bread is magical, the way it starts out all rough and ragged, then it gets all smooth and bouncy. And then it starts growing and gets all puffy. I’m happy as a puppy when I can spend the day in the kitchen throwing flour around. 3. Are there any downfalls to it? I can create mountains of dishes. It’s not that unusual to run the dishwasher twice in one day, and also have a pile of handwashing as well. 4. How do you balance work and life? They really seem to be the same thing. Food, sitting down to dinner, sending goodies to friends, family and co-workers – it’s all part of my normal life, and I’d be doing all that even if I didn’t have a blog. Okay, I might not be baking 5 loaves of bread on a random day, but I’d still be baking extras and sending them out into the world. 5. What does a typical day in the life of Donna look like? I usually check emails first, with coffee. Then it’s either cooking, baking or writing, depending on what needs my attention first. Mostly, it’s happy chaos. I usually do my writing in the evenings, while the TV is on. I blame my mother for that. She always had the TV on. All day. So, it was on when I was reading or doing homework and now it seems like I work better when I have that background noise. 6. How much time do you devote to blogging? Wow, I don’t know how I’d separate that from everything else I do. There are times when I’m making a recipe using a gadget I need to review for one site, and part of the recipe is for my blog, and another part of the recipe is for someone else. The actual blog writing is pretty quick, though. I write fast. 7. Is there any advice you would give to new bloggers? Don’t get caught up in stats and traffic and what everyone else is doing. Be yourself, find your own place, and have fun. Get to know other bloggers – they aren’t competition, they’re allies. 8. How do you decide what to blog and what not to blog? When it comes to promotions and sponsored posts, I won’t write about companies or products I don’t like. I think readers can tell when someone gushes over a product just because they’re being paid, and I don’t want that sort of thing on my blog. I’m all about moderation, so I’m not necessarily anti- junk food. I don’t blog a lot about those sorts of things simply because they’re not that conducive to recipes. But that doesn’t mean I won’t ever post about commercial cookies or chips or candy, when the mood strikes me. I’m also a sucker for new products, whether it’s something I found in the produce department of the grocery store, or if it’s something that’s sent to me by a company. I’m always willing to try new things and tell people about them. 9. What’s your worst kitchen disaster story? Shortly after we moved to Colorado – at high altitude – I decided to bake my favorite pound cake recipe. When I checked it, the batter was bubbling and blurping and spurting and dripping out of the pan and making an awful mess in the oven. I’d never seen anything like that before. It was like a horror movie swamp monster thing. Or maybe it was the time I was carrying a pot of boiling water and noodles to the sink to drain them and my grip slipped and I dumped the entire pot of boiling water on my foot. Nah, it was the pound cake. For sure. 10. If you had to describe your blog in three word what would they be? 11. If you had to pick a favourite flour for bread what would it be? Definitely King Arthur bread flour. It has a slightly higher protein content, and they keep stricter standards on the variation on that protein percentage than is required, so I know it’s consistent from one bag of flour to the next. 12. Do you have a favourite type of sweetener for your bread recipes? I don’t actually bake a lot of super sweet breads, but there’s usually a tablespoon of plain old white sugar to feed the yeast and help the browning. I do like honey for its flavor, though, so that often makes an appearance. 13. Do you have a particular blog post that you love that you feel is most you? I don’t know if I love it, but the post I wrote when my husband was about to be released from the hospital was a pretty raw one for me. 14. You have a cookbook coming out soon, tell us a little about that. It’s been a ton of work, no doubt about that. And maybe a ton of flour. It sure seems like it. 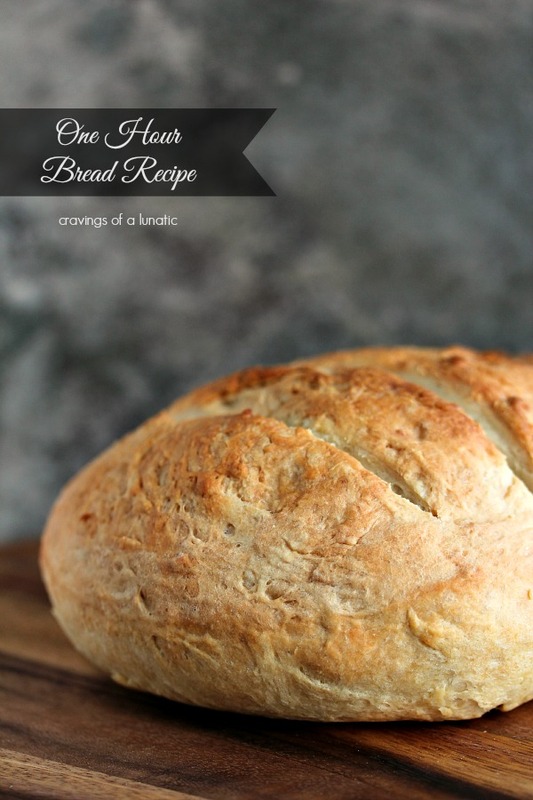 The book is called Make Ahead Bread, and the concept is that you do most or all of the prep work for bread or buns or other yeasty things ahead of time, so that you can bake the bread when you want it. So, you could do all the prep at night after the kids are in bed, and the next day when you get home from work, you turn on the oven, shove the pan full of buns in, and you can have homemade bread on a weeknight. Or do the prep at night and bake in the morning. Or do the prep before work in the morning and bake later in the day. It’s all about breaking the process into pieces so people can fit it into their schedules. The interesting thing is how many recipes didn’t work with this formula. There were a whole lot of breads that over-rose, or didn’t rise at all, or did other strange things. The ones that worked are great, but there were some that weren’t even crouton-worthy. 15. Tell us a little about Virtual Potluck? That’s one of the blog groups I belong to. We started a Facebook page when we were all doing sponsored posts about a particular cookbook. We wanted a private place to chat about what we were doing, how things were going … When the promotion ended, some of us decided to stay together and do group posts – a virtual potluck of recipes around themes, but loosely structured so they were a true potluck rather than a more structured dinner party. Some of our posts are sponsored and some are just for fun. It’s been interesting to see how the individuals in our little group have grown their blogs and their businesses in the time we’ve been together. I also belong to a blog group called 37 Cooks. I bet you’ll never guess how many people are in that one. 37 Cooks has a group blog, and some of the participants don’t have their own blogs, while other participants have very active blogs. It’s a fun group. 16. If you were preparing dinner for your friends what would you make? Well, there would be a basket of homemade buns for sure. Probably a big green salad with a couple choices of homemade salad dressing. And cake or pie with homemade ice cream. Um, and something in the middle. Let’s say lasagne. That’s always fun. 17. Tell us what you love about your kitchen, and what you don’t love. It’s small, so I don’t need to do a lot of walking to get from sink to stove to refrigerator. Mostly I just spin around a lot. So that’s good. But since it’s so small, there’s not a lot of space. And the ceiling is amazingly low. I can touch it without standing on my toes, and I’m not a giant. That makes it easy to change lightbulbs, but if someone hung a pot rack in there, I’d have to walk on my knees. It’s funny, because a lot of people say, “I’d love to see your kitchen” when they hear about all the food that comes out of it. They imagine some huge space with gleaming pot racks, wall ovens, marble counters, acres of counter space, magical fairies that clean and polish … But really, it’s a small, cramped galley-style kitchen that’s usually overrun with things in the giant pile of “I need to test/sample/review/use” and every work surface covered with food-in-progress. 18. If you could cook with one person from the past who would it be and why? I think Julia Child would be a hoot, but that’s probably too obvious a choice. So maybe one of my grandmothers. I never met either one, so it would be pretty cool to spend some kitchen time with one of them. I have no idea if either one was a good cook, so that could be an adventure. Not to mention their reactions to modern kitchens and my vast array of gadgets. 19. If you could eat dinner anywhere in the world where would it be? Italy, I think. But not at restaurants. I’d want to go to people’s homes. I also love Mexican food, so spending time with some good Mexican cooks would be fun. Or maybe just follow Rick Bayless around and snack on whatever he’s having. 20. Where do you see yourself in 5 years? Is blogging a big part of the picture? I’m pretty sure I’ll still be blogging because it’s fun, but I’d like to think that I’ll have another cookbook by then. I’m kind of exhausted from the final push on this one, but I have an idea for a new one and I’ve already started jotting down notes. Take a pic of you in the kitchen mid-baking/cooking mess. This is Donna in her kitchen cooking and baking up a storm. This is amazing. Donna told me the vertical rotisserie has home made gyros in it. Okay, seriously this lady makes fresh bread daily, AND homemade gyros. Donna, my dear, where have you been all my life? I am running out to buy a rotisserie so I can do this at home too. Impressive! I always make a recipe from each person I interview. The recipe is kept a surprise until the post goes up. I knew I had to make one of Donna’s bread recipes for the series. There was no way I was going to visit the Bread Queen and not make bread. I know most folks find bread intimidating because it takes some time to plan out. So instead of making one that had a longer process I chose to make a quick recipe that was not in the least bit intimidating. My hope is that it inspires people to try their hand at making their own bread. There is nothing quite like the smell of fresh bread baking in your house, well, except the taste of fresh bread being shovelled into your piehole. I make bread quite often, yet we eat it too fast to ever post about it. We are “eat it while it’s hot” people. So I knew I had to make it while the troops were at school and work. Then I would somehow have to hold my own dang self back. Challenge accepted, and almost successful. Drizzle olive oil on a baking pan. Set aside. Combine water, sugar and yeast in a medium sized bowl. Give it a quick stir and then let it stand for a few minutes to allow the yeast to foam up. This step is very important, if your yeast foams it's still good and you'll have some amazing bread on your hands. Add the flour and salt, stir until combined well. You can use any method that makes you happy. I did one by hand and one in my stand mixer just to see if there was much difference. There was not. Now you can mix and stretch by hand, Donna refers to this as air kneading. You basically just pick up the dough, hold an edge of it in each hand and pull it so it stretches out. It's going to get really stretchy, and likely tear, but just keep stretching, turning and folding until it smooths out. I added a little olive oil to one of mine and it seemed to really help me work the dough nicely. I turned it onto the counter and hand kneading it for a few minutes. Once it's smooth you can form it into a ball, set on the sheet and wrap it in plastic wrap. Then allow it to rise for 30 minutes in a warm spot. Once the dough is puffy, unwrap and lay on the baking sheet. Score the top with a knife as desired. You can also drizzle a little more olive oil or butter on top if you like. Place in the oven and cook for about 20 to 25 minutes. It's ready when the top is brown and the bread makes a hollow sound if you thump it. This is not an invitation to beat the tar out of bread, just give a slight whack with your knuckle, otherwise you'll be eating croutons instead of bread. Remove from oven and allow to cool on a rack. Good luck with this step. I don't think our bread has ever gotten the chance to cool completely in this house. Serve with a big old bread loving smile. Allowing bread to cool is super important to bread you will be slicing for sandwiches. 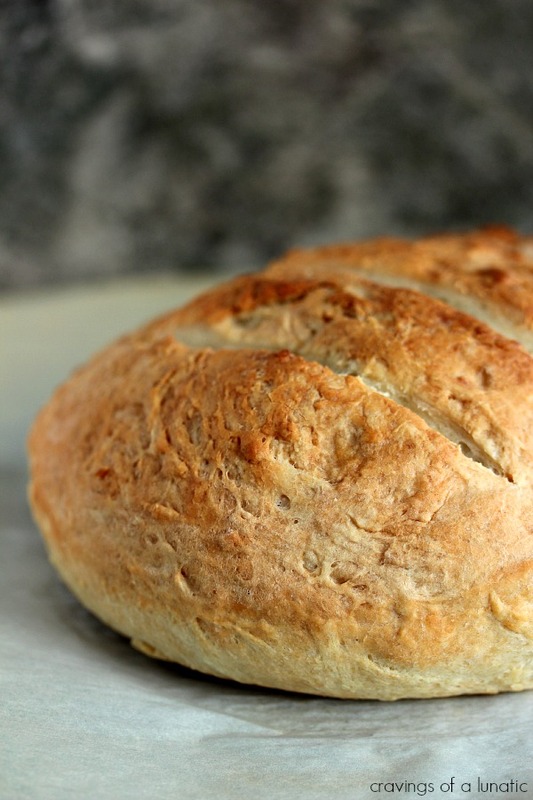 A rustic bread like this one is something we often serve warm with dinner. This bread was delicious. I made two and we demolished it in about a day. It’s so good. Quick, easy and a hit with the hooligans. You can’t ask for more than that. Except some butter to spread all over this. The only thing better than hot bread is hot bread smeared with tons of butter. Try for yourself and let me know what you think! Thank you so much to Donna for allowing me to poke about her life for today’s post. It was so much fun getting to know Donna better, and sharing more about her life with everyone. Make sure you stop by Cookistry to follow Donna’s adventures in the kitchen. Also be sure to mark your calendars for November 4, 2014. That’s the expected release date for Donna’s Cookbook “Make Ahead Bread: 100 Recipes for Bake-It-When-You-Want-It Yeast Breads”. Pre-order your copy now! A huge group giveaway you’re sure to love! A Sentimental Post with some food mixed in as always! Hope you enjoy your weekend. Spend lots of time with friends and family, eating mountains of food and making memories. Like all good weekends! This post contains affiliate links. Any purchases made through them is appreciated. It helps support my websites and the free content I provide. Thank you for your support and help along the way. Oooh, good Burning Down the Kitchen! Lovely to get to know more about Donna — terrific interview. Great recipe, too. We’ve been baking virtually all of our bread for the last year, and lately we’ve been playing with a quite similar recipe. It’s good stuff! And it doesn’t last long. 😉 Good read — thanks. Yum! Can’t wait to try this recipe. 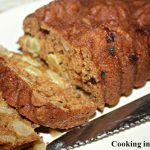 Have you tried adding part whole wheat or add-ins. I can’t eat whole wheat flour so no. But I bet it would be amazing. I always love these posts. Homemade bread is the best. In one hour, count me in. Kim and Donna, there is so much to love about this interview. Kim – I really adore your Burning Down the Kitchen interviews. You always ask amazing questions and get equally amazing answers. My favourite one from Donna is where she says not to worry about traffic and statistics and just get to know our fellow bloggers because they’re allies, not competition. <– This. Yes. To all of it. 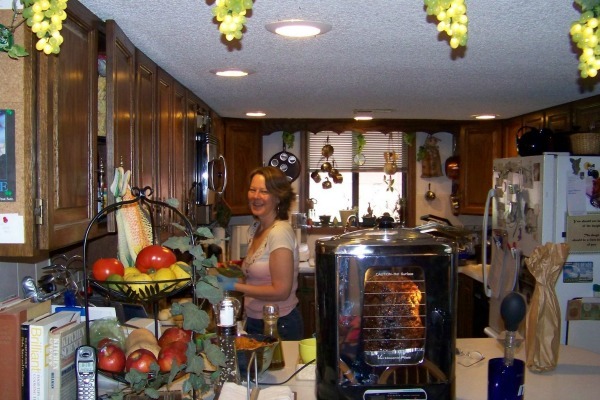 And the photo of her in her kitchen is so awesome. That rotisserie! I love it! I'm so excited for Donna's cookbook and I'm drooling over your gorgeous photos of this amazing bread. Holy moly I want to preorder that book! I know what you mean about make ahead bread. It was so nice to meet you Donna! Kim, that loaf of bread is making me so very hungry. Oh Kim! What a sweet and awesome interview with Donna!! Love the bread too! Oh, fun! Great interview Donna. 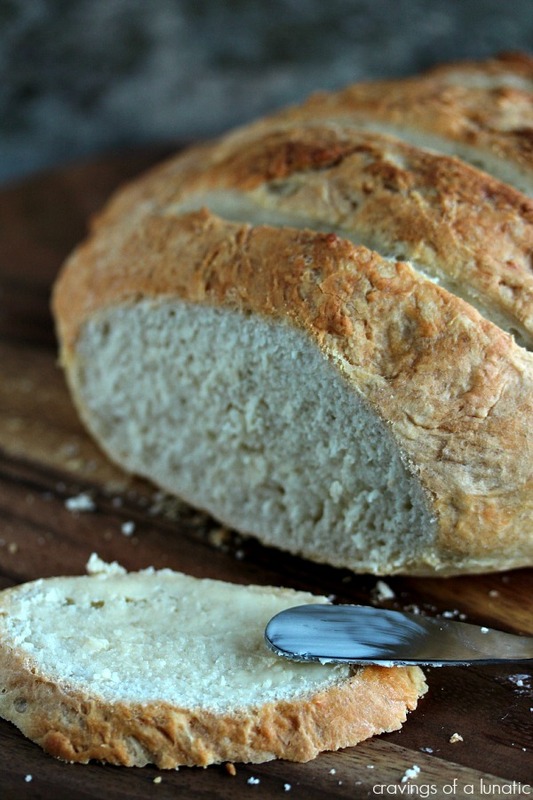 Yeast scares me… baking bread is on my bucket list. This might be the push I needed! Donna sounds like a way cool person. Thanks for introducing me to her! I’m going to have to look into that bread book. I always want to serve some kind of bread with meals, but don’t think about it in time to throw it together. I’m going to start with the loaf you made though. It looks amazing. What a great interview with Donna! I, too, make 1 hour bread, but it’s slightly different. I”ll have to give her version a whirl! What a fun interview with Donna and seriously one hour bread! I’ll be a bread bakin’ fool! Cngrats on the new series, Kim & I love Donna’s baking. Her breads are always mouthwatering! I had never baked bread before today, but your recipe seemed like something I could tackle and I decided to try it. It was crazy delicious! We will be making sandwiches tonight with some of our beautiful New Jersey tomatoes and enjoying every morsel. Thank you! 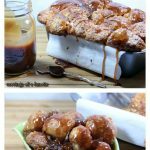 Question, I have a gluten issue along with potatoes, so any advice for making this yummy bread gluten and potato free? I’ve been saving this recipe for awhile on Pinterest. Just pulled it together and have left it to rise about. Can’t wait to see how it turns out, Thanks for a great recipe! Great interview! I enjoyed reading along and learning more about Donna while we celebrate the 1st anniversary of her book! Hi Megan. First of all thanks for giving the recipe a whirl. Secondly, here’s my thoughts on what’s happening. If you place it in a crock the sides are covered so there is no air flow to the sides the bread, the crock is not allowing the bread to bake the same way it would if it were on a flat pan. Not that there’s anything wrong with cooking bread in a crock. I’ve done them that way on occasion too. It’s quite a popular thing to do. But for this particular recipe the pan is preferred to cook it evenly and develop that crusty outside and soft inside. That said, how did it come out? Did it turn out? My thought is you probably had to at least double the cooking time in a crock. Please let me know how it turned out and feel free to offer feedback to anyone else who might like to cook it that way. If I have time tomorrow I’ll whip one up and try it in my crock. If not tomorrow, I know I’m cooking all day Tuesday. Looking forward to see how things went. Thank you for the reply! You are right, I nearly doubled the time. I had to add an extra 20 minutes. although it probably only needed 17-18 extra. It was nice and crusty on the outside though which I like. Next time I will bake straight on a pan! You’re most welcome. Never hesitate to ask questions. I’m always happy to help. If I ever take too long here on the blog just fire me an email to cravingsofalunatic@gmail.com. I’m so glad it worked. I figured it would double the time just because the crock sort of blocks the air flow and heat a bit. I love making mine both ways, never met a bread recipe I didn’t like. Ha. Absolutely. I’ve done it myself. This was a great recipe. I’m going to be honest and say I was super lazy about a few of the steps but it still came out delicious. I can see where I got lazy at and will improve it next time. And speaking of improving, do you think it would be ok to put seeds in it next time for more flavor and texture? Don’t know if that would be a good idea. I’m just a beginner at cooking in general. Thanks so much for posting this! I’m so glad you liked it. It’s a pretty forgiving recipe. Perfect for beginners. I think adding seeds would be totally cool. Are you going to add them into the dough or just toss on top? If I add 1/3-1/2 cup of chopped olives to this recipe, do I need to decrease the amount of flour? How would this addition affect the rise? Ok, I tried it and it was a disaster. I might not have let the dough rise enough, but Im sticking to the old fashion way. Hi Mike. So sorry to hear you bread didn’t rise enough and you were disappointed in the recipe. Did you use instant yeast and warm water to start? If there’s anything I can do to help if you decide to try again please let me know. We made it again for Christmas Day. Hoping to make a video for it so it’s easier for people to make it. 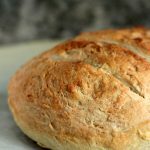 Absolutely love this bread recipe. We have made it several times and it always turns out perfect! 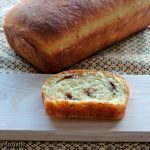 It is our go-to loaf bread recipe whenever we need a quick and delicious loaf! Thank you! Quick and delicious. 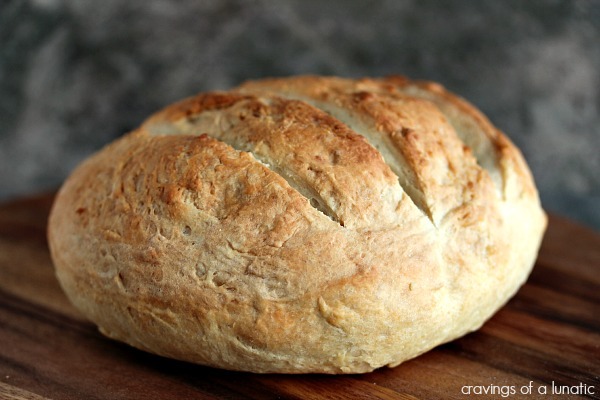 This has become my go-to recipe when I make homemade bread. Thank you! Thanks so much Kate. We love this one too. I love making it for holidays. This bread is fantastic! It has become a go-to when we want a fresh loaf of bread but didn’t plan enough in advance to have more time for the rise. This for us is to say most of the time LOL. Thanks for sharing this wonderful recipe. I’m so glad you liked it. We love making it for holidays because it’s so quick and easy. Thanks for taking the time to comment. It’s always nice to hear from people who try the recipes. 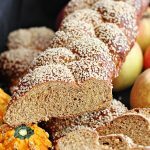 Can I use whole wheat flour or rye flour instead of white? Hi Rebecca. Sorry, just saw this. You can but it would be a denser bread. Which isn’t a bad thing. Hey! I have a question about some of the wording in your recipe. In step 2, you said to grease a baking pan with olive oil yet, in step 6, you said to lay the dough on a baking sheet. I assume you mean pan, but I wouldn’t want get the recipe wrong because that would be a waste. (just a side note: my friend recommended this recipe to me after she made a loaf for a potluck) Thank you! Hi Elizabeth. Sorry for the delayed response. I just saw this. Yes, it’s the same thing. 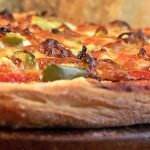 You can use a cookie sheet, baking pan or pizza stone. It’s a really good recipe. It’s super easy to make and always turns out amazing.